Over the past few months, Matt Flegenheimer of The Times has documented a few of what can charitably described as the MTA’s operating quirks. He wrote about the mad dash that happens between uptown express and local trains at 34th Street when an express Q faces off with a local N, and he profiled the way 6th Ave.-bound commuters at Essex/Delancey fill the staircase as they attempt to guess if the F will show up before the M or vice versa. A modern system, of course, would automate service announcements concerning these train operations, but the MTA isn’t there yet. Beginning at 9 p.m. on weekdays and Saturdays — as several signs on the platforms can attest — the station’s Madison Avenue exits are closed. But an interior gate often remained open about an hour longer, laying the trap that led riders to the escalator, the turnstiles, the gate and, after a few moments of deliberation, the decision: Jump the turnstile to seek another exit? Call for help? Or, for those without unlimited-ride MetroCards, spend a second fare, not to enter the subway system, but to escape it? On that night, and another, 48 hours earlier, the answer was about 20. Some paused for minutes at the turnstiles, contemplating a moral calculus that, according to transit officials, appears to be unique to 53rd Street.Over the course of two weeknights, about half of the riders hurdled over or ducked under the turnstiles. Several cajoled fellow passengers, who had not yet left the subway system, to push the emergency gate open. And the rest swiped their MetroCards, though for some, like Ms. Lingley, the possession of an unlimited-ride card eased the pain. The rest of the article concerns an examination into the ethics of turnstile-jumping. Even the MTA workers in this case urge riders trapped between a functioning turnstile and a locked exit to eschew another fare, but between the way the NYPD operates and the fact that many people using this station are tourists, the MTA has managed to capture some additional fares. Just jump. Now, the MTA grew a bit defensive over this article last night, and Adam Lisberg stressed on Twitter last night that the problem had been addressed. But I wanted to know why it took a New York Times article to solve the issue. The reporting process for issues such as these isn’t transparent, and even with a streamlined website, it’s not immediately obvious how to report a problem. I see this, though, as a problem that shouldn’t have arisen in the first place. When the MTA forges agreements with the companies that operate these station complexes, it should pay attention to work shift schedules and the reality of the situation. Somewhere along the way, the left hand of real estate stopped speaking with the right hand of worker operations, and as a result, some subway riders found a working fare control area with a locked exit on the other side. That’s nearly as bad as New Jersey Transit’s $100,000 fence. To honor a mayor, Maloney proposes a new name for 77th St. When a water main broke in Manhattan on Friday, initial reports highlighted a quirk of the New York City subway’s station naming convention. The first stories spoke only of a problem at 23rd St., but for a few minutes, not a single news outlet named which 23rd St. station. With five subway stations all carrying the 23rd St. moniker arrayed along the street in Manhattan, it was a prime opportunity for confusion. Across the city, similar situations exist as subway lines stop at major cross-streets and popular intersections, but by and large, station names are indicative of the streets they’re on. Need to get to Chelsea? Take the A, C or E to 14th St. Looking for Brooklyn Heights? Get thee to Clark St. While some cities — D.C. comes to mind — feature station names with neighborhoods, areas and tourists attractions all shoved into one giant sign, New York has gone for simplicity and geography. Now, though, name creep has seemingly begun, and we can point to Ed Koch for that one. According to reports this morning, Rep. Carolyn Maloney and city politicians are leading an effort to convince the MTA to rename the 77th St. station in honor of the late former mayor. Maloney says 77th St. was Koch’s favorite station — perhaps due to the number of donors who lived in the area — and the City Council will take up legislation to call for a new name for the station. I can’t imagine much will come of this even if the City Council passes such a symbolic resolution. It isn’t ultimately up to the City Council what subway stations will be named, and one MTA spokesperson said to me via Twitter, simply that the agency isn’t going to rename a subway station after anyone, living or dead, famous or not. 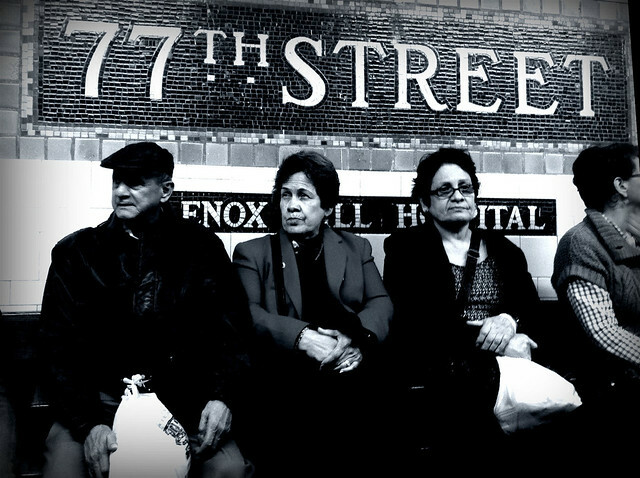 It should forever remain 77th St. until we no longer call the cross-street 77th. Outside of the supposed honor, there is also a cost. Station signs would have to be reprinted; maps would have to be updated; and the prerecorded announcements used in the rolling stock along the Lexington Ave. line would have to re-recorded. None of this is free. Meanwhile, a few months ago, the move to rename the Brooklyn-Battery Tunnel after Gov. Hugh L. Carey drew derision as well. We don’t need to name our infrastructure after people, and we shouldn’t remove helpful indicators of location from station names. Ed Koch has a bridge; he doesn’t need a subway station as well. By now, I’m sure many of you have seen the video from Dean Peterson that’s been making the rounds. The Brooklyn-based videographer took to his local subway station — 36th St. along 4th Ave. — and filmed an amusing two minutes of straphangers tripping up the stairs. This station, along with some others, has an uneven staircase that has long been a part of station lore. No one had bothered to fix it until today. The video has been viewed now over 530,000 times, and apparently, someone at the MTA noted it as well for, as NBC New York reported, the staircase is now closed for repairs. Considering Transit’s track record with staircase repair work, I’d imagine this entrance will be out of commission for a few weeks as crews realign the steps, but that’s practically besides the point. Why did it take a viral video to gain some attention? It seems that no one at Transit had realized the imperfection, and that’s somewhat reasonable. No one is measuring every step at every station. Furthermore, perhaps straphangers who tripped simply chalked it up to their own stumbles. But if one person noticed the same stair as a problem over and over again, I’m sure some others did as well. Shouldn’t we have a system in place that allows New Yorkers to report these problems to someone who will listen? I don’t think viral videos are the way to go to get every routine maintenance problem in the subway addressed. Thanks to @TheRealKroll and @tommy_bennett for passing this one along. Is it ever OK to hop the turnstile? In terms of gems from the City Council, here is another one, courtesy of The Daily News. Recently, while speaking with reporters, City Council member Robert Jackson told a tale involving his wife and an unstaffed subway entrance. Apparently, the MetroCard Machines at 181st St. weren’t working, and no station agents work at the entrance in question. I want to pose this a different way: Do you ever consider a fare jump acceptable? Personally, I’m never without at least one and usually two MetroCards. I keep my unlimited on hand and have an emergency pay-per-ride back-up just in case. That way, I’m never faced with the possibility that I can’t board a bus or ride the subway. Furthermore, as every station complex has at least one staffed entrance, I also don’t think walking to that entrance with a person or working machines is too onerous. Apparently, though, politicians whose lack of support for the MTA has led to the dismissal of those station agents disagree. When it comes to transit oversight, New York’s illustrious City Council is all bluster with little bite. The Mayor has the option to name appointees to the MTA Board, and New York City Transit operates under the auspicies of the MTA — a state agency. So when it comes to oversight, City Council members can haul MTA officials before them for a tongue-lashing, but they can’t actually do anything. On Wednesday, this impotence was in full display in all of its sheer absurdity. This tale of woe begins on Wednesday morning with some truthful comments from MTA Chairman Joe Lhota or, alternatively, in the mid-1950s when the city punted on transit issues and funding. Council members, responsible only for statutory and contractually obligated parts of the MTA budget, receive myriad constituent complaints, but as Lhota noted to reporters during the monthly board member, they can’t really do anything about it. And if it’s one thing New York City politicians hate to hear, it’s how they can’t do something about what their voters consider to be a problem. With trash in the news and New Yorkers complaining about the condition of their subway stations, Council Member Peter Koo told the MTA that he wanted to institute a letter grading system for subway stations based on cleanliness. Now, New Yorkers are quite familiar with letter grades. Even though the Department of Health’s restaurant inspection system doesn’t understand the subtlety of food preparation, the letter grades are everywhere. Some people won’t eat in restaurants with B’s or C’s; others figure that if the place is open, it passed an inspection. Why can’t we, indeed? Perhaps, it doesn’t make sense because food preparation and consumption are not the same as travel. Perhaps it doesn’t make sense because we’re beholden to one subway stop. We’re not going to walk a half a mile to find a slightly cleaner subway station. Perhaps it doesn’t make sense because what you see is what you get in the subway. I can see grime, trash and rats. I don’t need to be told that they exist. As one straphanger said to The Wall Street Journal: “They are relatively clean. Who needs a rating? If it has a ‘D’ grade, a failing grade, are you going to not stop there?” Other riders professed to care about service frequency above all else. One City Council member who seemed to grasp the absurdity of it all offered up an actual use for such a grading system. While still requiring the MTA to foot half the bill for this misguided and useless idea, Domenic M. Recchia, head of the Finance Committee, suggested that such a system would allow council members to better determine if discretionary funds should go toward subway station cleanliness. Think of it as a halfway house toward an adopt-a-station program I’ve mentioned on and off over the years. But let’s pause for a second and figure out what’s really going on here. Why would the Council even be in such a position to bloviate? It wants “accountability” from the agency on why it needs a fare hike next year — something the authority has provided in droves — and the MTA wants more funding from the city. As the latter won’t happen, the Council decided to do all it could do to mock the authority in public. Hence, letter grades for the subway system. The City Council will never embrace taking responsibility for New York City Transit. It doesn’t want the financial or political headaches that come with such control. And so we are left with a situation where the Council will not provide proper oversight or the money the MTA needs to clean their obviously dirty stations. We just get bad — and silly — ideas. An ex-con who once stole $10 million from the MTA and served jail time for the payroll scam was hired by an MTA contractor to again oversee payroll, this time on the East Side Access project. It’s an “only in New York, only involving the MTA” story uncovered this weekend by The Daily News, and it underscores the challenges an agency the size of the MTA faces in an industry with few checks and balances. Since November, Jimmy Roemer has helped manage the payroll at the MTA’s biggest construction site — the $7.3 billion East Side Access tunnel that will someday link the Long Island Rail Road to Grand Central Terminal. He’s had prior experience managing payroll at another MTA work site — though perhaps not the kind of experience the MTA would want. As he pleaded guilty to six counts — including fraud, obstruction of justice and tax evasion — in 2003, he explained how managing the payroll allowed him to routinely inflate workers’ hours and bill for workers who did not exist. This is precisely the job he’s held for the last six months: determining how many workers are needed each day and signing off on time cards for Dragados-Judlau, which has $1.1 billion in MTA contracts at the East Side Access tunnel. Roemer, who helped funnel money to the Genovese crime family and still owes the MTA $200,000 in restitution, has been removed from his post and declined to comment to The News. The incident itself is a black eye for Dragados-Judlau and reflects poorly on the MTA too. That said, the authority isn’t exactly in a position to run background checks on every single employee hired by its various contractors. Considering the number of contractor employees working on MTA projects, such a process would be exceedingly cost and time-consuming. Still, something broke down somewhere. Dragados-Judlau seems to have only the barest of checks in place, and they seemingly rely on the honor system. Clevenstine’s comment concerning a union man filling a union position speaks volumes on the state of play (although Roemer will soon be a former member of Local 14, according to recent reports). If the contractors can find a few good union men for those union positions, they have no need to go that extra mile. The MTA, meanwhile, has no checks in place. They could provide contractors with a list of people convicted of a fraud similar to Roemer’s. Considering convictions for these crimes are relatively uncommon, such a list should be easy to put together, and it would behoove the authority to figure out a way to achieve this end. After all, this revelation looks bad, especially on a project that’s already delayed and over budget for a whole mess of reasons. Ultimately, this news strikes me more as business as usual than any such great revelation. It’s a crooked business with only a handful of powerful contractors bidding on each MTA project, and they need to come in under their competitive bids. The process failed here as it has so many other times in the past. As Transit tries to make its garbage collection problem go away, news coverage of the effort has found a comfortable narrative: The debate focuses around rider behavior and Transit services. As a forum on Thursday, Transit president Thomas Prendergast said the trash can-free pilot has been a success. MTA workers have found the stations without trash cleaner while the MTA hasn’t had to deal with as much trash. Yet despite this early success, riders aren’t happy even as they’re complying with the new rules. “They’re are a lot of people that think it’s backwards and that it’s not what we should do. So, we haven’t been able to change their mind from a perceptual standpoint. But from a behavioral standpoint, we have,” Prendergast said. Perhaps, then, these riders have taken their cues from rider advocates. Speaking at the same forum, Straphangers Campaign head Gene Russianoff explained how he feels trash cans are a no-brainer. “It’s a service to your customers to give them a waste paper basket,” he said. Should the MTA be able to provide both garbage cans and subway service for its passengers? As I wrote a few weeks ago, it’s a question that reaches the fundamental core of the MTA’s role. Likely they should be able to offer both, but customers seem to respect the station environment more if there are no trash cans. If I have to pick one, I’m opting for a cleaner station with no trash cans over a dirtier station with such a can. Removing trash cans a subway cure for litter? Without trash cans, littler wouldn't even start here. Every now and then, the MTA puts forward some zany idea that they call a “pilot program.” Sometimes, those programs involve scaling back service during minor holidays; sometimes, those involve replacing wooden benches with stainless. Recently, the MTA has tried to combat garbage through a rather counterintuitive pilot program: They removed all garbage bins from a station platform. When the MTA first announced this pilot in October, it seemed to represent the final hurrah of the Walder era. It was an idea that would spring from someone with a McKinsey background, but Joe Lhota vowed to continue it, pending the outcome. For a little while, at least, 8th Street on the BMT Broadway line, a station heavily trafficked by NYU students and East Village-bound revelers alike, would feature no trash receptacles. Initially, those watching the MTA were skeptical. Some believed the authority should add more trash receptacle to combat station litter. Others accused the authority of making the trash someone else’s problem. Those who would not just litter even in the absence of a trash can would be focused to carry their refuse out into the streets. The city wouldn’t notice less litter, but the MTA wouldn’t have to deal it. The MTA launched a publicity campaign to alert riders, and now many straphangers discard their trash before entering those stations or hang onto it until they encounter a receptacle at the next station or on the street. Cleaners have been bagging less trash from platforms and tracks at the two stops — Eighth St. on the N and R lines in Manhattan, and Main St. on the No. 7 line in Flushing, Queens, transit officials said. …Considering the amount of garbage the MTA hauls from the subway — 14,000 tons a year — exploring any option that could reduce the burden is worthwhile. And since it’s working, the authority should expand the pilot — not junk it. Maybe the MTA should cite security concerns as the reason for the move. The Port Authority removed garbage trains from its much smaller system after the 9/11 terror attacks more than a decade ago. The London Underground removed bins long ago because of bombing campaigns by the Irish Republican Army to end British rule of northern Ireland. But it’s even simpler than that: The MTA could frame this discussion as one about its role. The authority is not a trash-collection agency, and if straphangers bring their garbage underground, the MTA necessarily becomes a trash collection agency. They have to devote track space, personnel hours and monetary resources toward cleanliness and litter collection. But without trash cans, if passengers are bringing their garbage with them either to stations with trash receptacles or to the nearest street level can, the MTA won’t have as much trash to collect. Lately, a bill in Albany to ban food underground has gained headlines. Senator Bill Perkins wants to cut back on items in the subway that attract rodents. Perhaps though the simpler solution is to remove the vast majority of trash cans. By centralizing trash collection, the MTA can better remove garbage from the system while spending less on something that isn’t a core service, and if trash moves above ground, well, that’s why the city has a Department of Sanitation. Sometimes, it seems, those ideas that seem the craziest end up working better than we expect. If only all thinking on subway operations were as creative as that. Now that the MTA has made public its plans to replace its wooden station benches with metal ones, the authority must also figure out how best to dispose of the old wooden ones. As these benches will be considered surplus materials, they will, reports The Daily News, be available for sale for $650 each. “Get set to enjoy the ambiance of the New York City transit system,” Mike Zacchea, Transit’s assistant chief operations officer, said. If any of you plan to buy one, please take a photo of this “iconic” bench at its new home. I’d love to see how an interior decorator approaches this one. The New York City Transit Rules of Conduct present an entertaining document for those with the patience to wade through a whole bunch of legalese. It is, for instance, a violation to play to music in the subways other than that “listened to solely by headphones or earphones and inaudible to others,” and straphangers may not “cause annoyance, alarm or inconvenience to a reasonable person or create a breach of the peace.” Clearly, these are rules that aren’t enforced more often than they are. Now, while the same standard applies to just about every rule Transit has put forward, now and then, cops do decide to enforce the rules. One of those rules — 1050.7 (10) — concerns straphanger behavior on subway seats. No person, the rule says, may “occupy more than one seat on a station, platform or conveyance when to do so would interfere or tend to interfere with the operation of the Authority’s transit system or the comfort of other passengers.” The next part bans passengers from “plac[ing] his or her foot on a seat on a station, platform or conveyance.” To violate that one is to commit a crime that can lead to an arrest. Arrests, as I’m sure most passengers know, are few and far between. In fact, even a summons for such behavior is rare, and we’ve seen countless people both take up more than their fair share of space or prop their feet up late at night on an empty train. Personally, I don’t condone such behavior. It’s inconsiderate of others who must later sit in that seat and inherently selfish, but as crimes go, it is nearly victimless. Police officers handed out more than 6,000 tickets for these violations in 2011. But a $50 ticket would have been welcome compared with the trouble many passengers found themselves in; roughly 1,600 people like Mr. Peppers were arrested, sometimes waiting more than a day to be brought before a judge and released, according to statistics from district attorneys’ offices. In some instances, passengers were arrested because they had outstanding warrants, or did not have photo identification. Some arrests were harder to explain, with no apparent cause other than the seat violation. In at least one case, the arrest led to deportation. It is not clear why [William] Peppers [who spent 12 hours in jail] was not just given a ticket. He had an arrest record that dated back three decades and involved firearm possession, robbery and the sale of crack cocaine; in 2009 he was released from prison, where he has spent much of his adult life. But he and his lawyer said there was no warrant for his arrest. Citing the controversial “broken windows” theory, NYPD officials claim targeting these quality-of-life offenders keeps the subway system safe. “One of the reasons that crime on the subways has plummeted from almost 50 crimes a day in 1990 to only seven now is because the NYPD enforces violations large and small, often encountering armed or wanted felons engaged in relatively minor offenses, like putting their feet up, smoking on a platform, walking or riding between cars, or fare beating,” Paul Browne, an NYPD spokesman, said. Still, off the record, cops claim that supervisors push them to “bring in one collar” per month. Oftentimes, violators do have outstanding warrants, but now some otherwise innocent defenders are fighting back. One diabetic who wound up in jail secured a $150,000 judgment against the city when cops denied him access to insulin. He was arrested for putting his foot on a seat in order to inject himself with his insulin. Another has filed a suit because police detained him on grounds of an outstanding warrant when such a warrant did not exist. A third had his case dismissed on a promise of good behavior after he was arrested when he dozed off and his leg “leaned on the empty seat next to him,” says The Times. As I read this story over the weekend, the one word I kept returning to was “overreaction.” It’s important to maintain, as one of those endless automated announcements reminds us, an orderly and clean subway system, but doing so while violating the civil rights of others and basic common sense seems a bit over the top to me. Perhaps such a violation should carry a fine, but to arrest people for putting their foot on a seat in an empty subway car at 2:30 a.m. isn’t what these Rules of Conduct are about.